and the New Mexico Department of Transportation. Since 1954, New Mexico has been the home of the nation's first and longest continuing Highway Archaeology Program. The Federal Highway Administration, the New Mexico Department of Transportation, and the Museum of New Mexico jointly fostered this program, over their common concern that irreplaceable parts of our country's past were being lost to construction. Protecting cultural resources is still a collaborative effort involving federal and state agencies, tribal communities, and committed archaeologists. Today, all highway construction projects designed to improve our roadways are preceded by archaeological investigations. Sponsored by the New Mexico Department of Transportation, this research provides a unique opportunity to advance our understanding of the past and to better tell the story of New Mexico's rich cultural legacy. 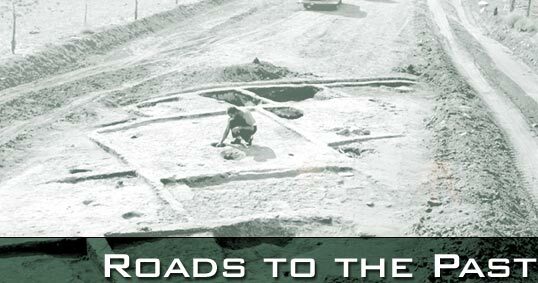 Developed through the efforts of the Museum of New Mexico and the New Mexico Department of Transportation, this exhibit celebrates the history of the New Mexico Highway Archaeology Program and highlights some of the many important discoveries that benefit both professionals and the public. Unless otherwise noted, all artifacts, maps, and photos are in the collections of the Museum of Indian Arts & Culture/Laboratory of Anthropology, a division of the Museum of New Mexico.